I’ve been doing remote energy healings for about four years now. I’ve never facilitated a session where one or more other-dimensional entities didn’t show up for the person I was working with. But because the beings have always come specifically for that person, I’ve never had a repeat visitor. Saturday before last, I had a session with Manuel Abrego, partially about his back pain. The second I put his etheric body onto the etheric table, a large golden Reptilian approached the table from the other side. Huge surprise. He seemed imposing, powerful. The Reptilian immediately went to work on Manuel by separating each vertebra from the one next to it. As he worked, he tapped each one with a claw, causing it to turn a light blue. He then walked around to the top of Manuel’s head and blew breath down the length of his spine. At the end of the session, during which other issues were addressed, I returned to Manuel’s back pain and asked the golden Reptilian if he would like to come back in. Yes. He laid Manuel back on the table, placed his hands on opposite sides of his head and sent golden light from his right hand into the left side of Manuel’s body and vice versa. Three times. Then he again breathed into the top of Manuel’s head down through his spine. Three times. He took Manuel’s hands and helped him to stand up. Golden light streamed from his third eye into Manuel’s third eye. He squeezed Manuel’s hands and smiled. Needless to say, this was absolutely fascinating to watch. Although I deeply appreciated his help, I never expected to see the Reptilian again. That was Saturday. On Monday I went to yoga class. 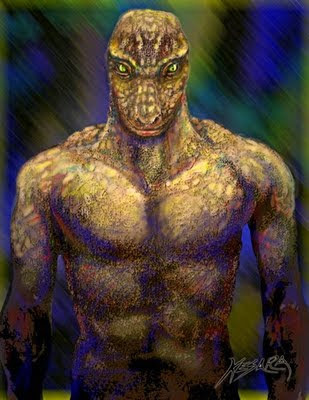 At the end of the class, during shivassana, I felt the very strong presence of the Reptilian, whom I dubbed the GRH: Golden Reptilian Healer. He hovered 10 feet away from me and indicated that he’s available to help with others. Cool, I thought. I had a session scheduled for Wednesday with Vashta Narada, who also has had recurring back issues. I wondered if the Reptilian might make another appearance. As usual, I laid Vashta on the etheric table. The GRH approached her slowly, gently. He began to massage the muscles on either side of her spine, totally unlike the way he’d worked with Manuel. He offered several suggestions that Vashta might use to improve the issue, then laid warm wet white towels on her back. He sat down beside the table, held one of her hands and stroked her head. He softly sang a light-language lullaby. After the session, when I’d come out of my altered state, I thought about the difference between the ways the GRH had worked with Manuel and with Vashta. With Manuel he was very deliberate in his movements, almost authoritative, very masculine. With Vashta he was gentle, nurturing, more feminine. I wondered what would happen if he showed up again. Two days later I had a session with Joanne Prendergast. Again, the GRH was the first being to appear before I moved on to other issues. He simply performed a Reiki-like healing on her before disappearing. Again, a completely different M.O. than with either Manuel or Vashta. Of course, Manuel, Vashta and Jo all had other issues that were addressed by other beings. The other aspect they all had in common was the appearance of other-dimensional children – hybrids, “homeworld” kids and/or Earth children. I’m always and forever grateful to all of the beings who show up to help the people I’m working with. But to have the GRH be a repeat visitor – and one willing to help in such different ways – feels pretty special. So far, he’s worked with an American, a Serbian and an Irishwoman. A global, equal-opportunity healer. ☺ I can’t wait to see what’s next.